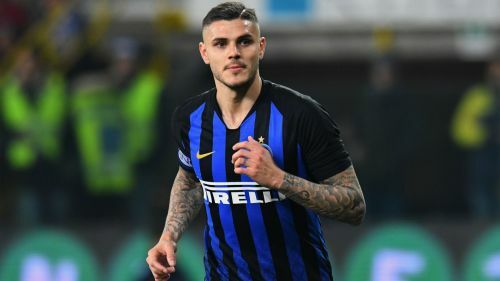 Inter head coach Luciano Spalletti is unwilling to continue discussing Mauro Icardi's situation, vowing to focus solely on those who "care about the fate of Inter". Icardi was stripped of the club's captaincy this month and then withdrew himself from selection for the Europa League last-32 first-leg tie against Rapid Vienna on February 14, citing a knee injury. The Argentina striker has since missed Serie A games against Sampdoria and Fiorentina, as well as the second leg against Rapid. The 26-year-old has been linked with Juventus, Napoli, Real Madrid, Barcelona and Manchester United, but his wife and agent Wanda Nara this week said he was "super happy" at the club. Ahead of Inter's trip to Cagliari on Friday, Spalletti did not want to speak about Icardi. "Many things have already been said about Icardi by [chief executive Giuseppe] Marotta and [president Steven] Zhang," said the coach. "From now on I'll only talk about the players that are available for selection, not those who aren't, because they're the ones who are on the field and care about the fate of Inter. "I won't talk about the others anymore." Spalletti instead chose to praise the contribution of Icardi's replacement Lautaro Martinez. The former Racing Club forward has failed to score in his last three games but put in an all-action display in Sunday's 3-3 draw with Fiorentina. | IN THE NET IN A FLASH! "He [Martinez] is doing really well. He put in a top performance in Florence and he has plenty of qualities to help the team. "He's dealt extremely well with the responsibility that he's been given. His team-mates are relaxed with him up front." Spalletti admitted to lingering frustrations over the dramatic use of VAR in the draw with Fiorentina but insists that it is "the future". The Inter boss fumed over referee Rosario Abisso's decision to award a penalty when Danilo D'Ambrosio was deemed to have handled the ball in the sixth of seven additional minutes, with Fiorentina's Jordan Veretout converting the spot-kick after a five-minute VAR check. Abisso consulted the video review system having pointed to the spot initially and he stuck with his original decision, despite the ball appearing to strike D'Ambrosio's chest. The result, which saw Inter squander a 3-1 lead in the second half in Florence, left Spalletti's side just two points above fourth-place city rivals AC Milan. "There's still a bit of annoyance," he said of the incident. "VAR is a perfect instrument, yet at times incidents are even hard to analyse on a screen. "It's only right that it's used five or six times during a game if necessary. We need to keep using it; it's the future."